PCAF (P300/CBP-associated factor) has been identified in several species and is a nuclear histone acetylase which plays a role in the regulation of transcription, cell cycle progression and differentiation. Human PCAF is a ubiquitous protein member of the GCN5-related histone acetyltransferas superfamily. PCAF interacts with P300 and CBP transcriptional cofactors and acetylates all 4 core-histones. Also, it has been also shown to acetylate various other proteins, including the transcription factors p53 and p65. 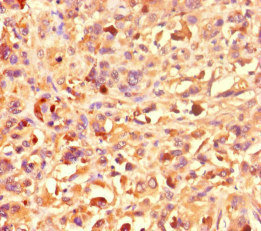 PCAF Polyclonal Antibody. Unconjugated. Raised in: Rabbit. Xiong Y et. al. (June 2014). Differential Coupling of KLF10 to Sin3-HDAC and PCAF Regulates the Inducibility of the FOXP3 Gene. Am J Physiol Regul Integr Comp Physiol.